Sad news for race fans as the iconic Oak Tree at the Virginia International Raceway collapsed today after cracking at the base and falling on the on the track. It's the most recognizable landmark at the facility, marking the apex at the Oak Tree Turn. Alton, VA, July 2, 2113 – There is no easy way to say this – The Oak Tree is down. The iconic landmark that has come to symbolize VIRginia International Raceway has fallen, broken at the base. 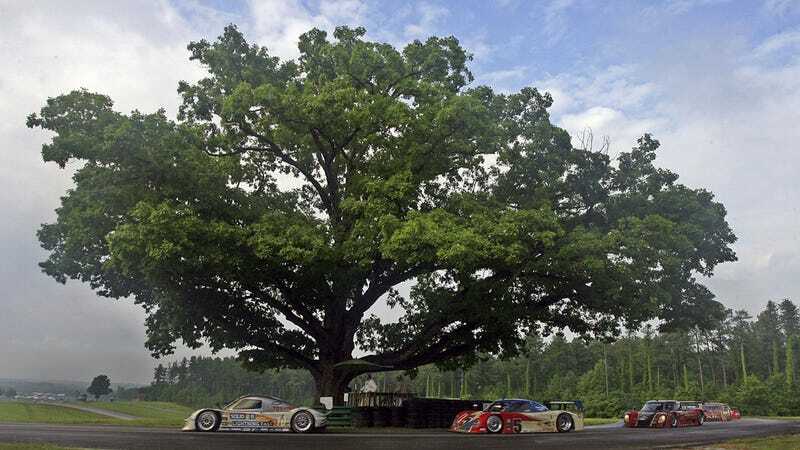 The massive oak stood sentinel at the south end of the racetrack, looking out from the highest point on the property at the sprawling facility and its 3.27 miles of serpentine asphalt that has come to be regarded as the most challenging in North America, if not the world. Its branches shaded the apex of the legendary Oak Tree Turn, looking down on the likes of Roger Penske, Walt Hansgen, Tom Kristensen and Richard Petty as well as a host of race drivers from the brilliant to the not so. I've had the pleasure of both racing around the Oak Tree turn and watching other people do so. No word yet on a replacement or a cause, although we've had a lot of rain in Virginia the last week or so.